I pinned this a looong time ago on Pinterest, and actually started making it about six months ago. And since I am such a prompt blogger, you are now getting this post WELL after I meant to write it. Ah well. Such is the life of a bubble-head. So, anyway. Let me give you a little back story. I used to wipe down all of our kitchen surfaces with Windex, and then one day while I made dinner, I noticed Jack licking the table (Eh, kids are weird). I don't necessarily encourage table-licking, but I think that you have to pick your battles, you know? I got to thinking about how I had just cleaned the table, so it wasn't a big deal that he licked it, but then I got to thinking...would I let my baby drink Windex? No. No I would not. So the search for a safe cleaner came into play. I found this on the blog Vicariously Vintage, but there are a LOT of tutorials out there. This is the way WE do it. I keep a plastic container in the door of our freezer, and as we eat oranges, I simply put our peels in there instead of in the garbage. When my container is full, I jam as many peels as I can into a mason jar (it helps to let them thaw first). Then I pour white vinegar into the jar, all the way up to the brim. I shake it up, and pop in into the fridge. About twice a week (or more if you think about it), I take the jar out, and I shake it up, then put it back in. I would give it a minimum of two or three weeks in there, but longer won't hurt. When you notice the liquid has the consistency of oil, you can strain it out. Don't forget to squeeze the oil out of the peels before you throw them away. 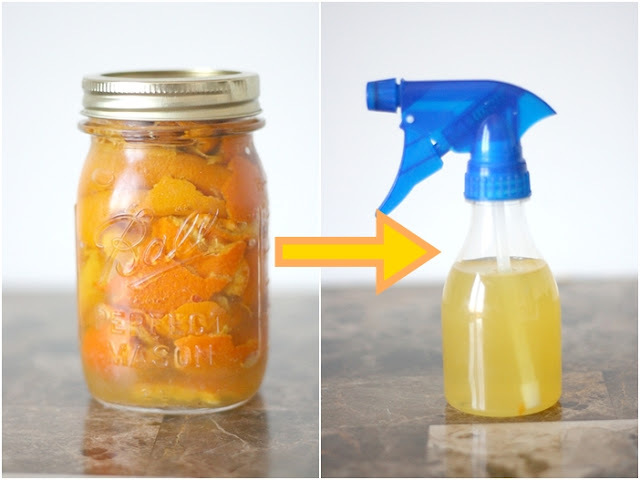 I then fill up my squirt bottle, half Orange Oil, half water, and voila! A cleaner that WORKS, and is safe for all the table-lickers out there. i.m gonna do it. must remember to buy oranges! I buy the bag of 'cuties' and we use those peels! I am told it works with Lemon peels as well, but Ive never used 'em! Oh! I forgot to mention, it smells orangey, and does NOT dry sticky! And it probably smells great!